LotusOpening News |: Does Governor Joe Manchin Believe that Gay and Lesbian Americans Have a Different Nationality? Does Governor Joe Manchin Believe that Gay and Lesbian Americans Have a Different Nationality? Here's a story that just surfaced today from Think Progress.org's Wonk Room, indicating that West Virginia Democratic Governor Joe Manchin, who's currently running for the Senate seat left by the late Senator Robert Byrd, believes that it's OK to delay the civil rights of our gay and lesbian military service men and women, by "waiting" until the military leaders "certify" that the repeal of Don't Ask Don't Tell won't harm unit cohesiveness. 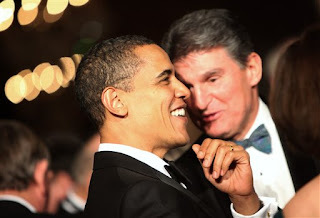 I had hoped for better from Governor Manchin, but so did I of President Obama. Apparently Governor Manchin, like the President, gets it not, that the rights all Americans are guaranteed under our U.S. Constitution, and knows not or cares not what it's like to be an LGBT American Citizen, and to experience the hateful, damaging effects of endless government-sponsored discrimination, from the federal to the local levels. I wonder if Governor Manchin believes gay and lesbian Americans have a different nationality under another Constitution? I wish someone would ask him that question. WV Governor Joe Manchin Won’t Vote To Repeal Don’t Ask, Don’t Tell Until "Study Is Certified"
Reality is settling in and many advocates for repeal of “don’t ask, don’t tell” have begun to acknowledge that passing the National Defense Authorization Act in the lame-duck session after the midterm elections is unlikely at best and could ultimately rest in the hands of Republicans. A nearly insurmountable series of negatives seem to be stacking up: The White House is not engaged, time is running terribly short, Republicans are winning the political battle on the legislation, the midterms only stand to weaken Senate Democrats, and many fear the release of the Pentagon’s study of repeal in early December could deal a final blow to the effort. “When you actually look at how much time Congress has to be here in lame duck, and the appetite to get difficult bills done, it will be very difficult to move the defense authorization bill,” said Winnie Stachelberg, who is vice president of external affairs at the Center for American Progress and has worked on the repeal effort. The Governor doesn’t believe the rules should be changed until the battlefield commanders can certify it doesn’t hurt unit cohesion. All this means that the Senate is unlikely to take up the measure before the Pentagon releases its study, further delaying and jeopardizing repeal efforts.